I suppose that there is not nearly enough time to visit every courthouse or every covered bridge. So, I have some modest goals. I would like to visit every state and perhaps get a picture of a courthouse in each state that I DO visit. I would like to complete each state along the eastern seaboard at some point--knowing that states like Pennsylvania and Virginia will be long term projects rather than short term. I have completed a number of states--five of six New England states, South Carolina, Delaware, Florida, and Georgia. I may re-visit some to get better pictures as I have already done with some covered bridges. But the planning is almost as much fun for me as the trips. Sometimes, there will be a trip planned with my wife. This past summer, she had a conference in Grand Rapids, Michigan. I planned day trips. I mapped them out in different directions. I wrote down mileages. I searched to see if old and new courthouses still existed. I looked to see if there might be some covered bridges along the way. I completed power points with pictures of the buildings that I hoped to see. I researched street addresses. I used the courthouse history site. I found a great courthouse book. And I adapted. I visited 45 of 83 counties during my 5 day trips--one of which was only an afternoon trek. I keep a notebook that charts my path that also has a printed out power point, county maps with seats, a county outline map which I color in to show where I plan to go, and an accumulated mileage to get an idea as to where my day will end. I usually can reach 500 miles in summer and 400 in winter if I time it right. I reached 600+ miles on day 1 of my moving trip. If it is a continuous journey, I may have multiple states within the plan. I also maintain power points of each state which I have printed out in binders which contain most of my photos. I take pictures of the county signs, monuments, downtowns, other interesting buildings, and even squirrels, in addition to the courthouse buildings. I try to get whole building shots, tower/cupola shots, entryway shots, and unique feature shots. I have books for states I have completed and ones for states I plan to visit. The text in some books helps me to locate older buildings like the one in Catskill, New York, that once were courthouses. Not every state has such a book, but the ones I have purchased are of top quality. I have a Missouri book for a trip next February, for example. A second trip might occur next summer. But rather than trying to do the entire state of Missouri, I will get pictures in neighboring states as well. Chronicling these trips in order of occurrence is not something I am led to do, which is a slight departure from what you've seen so far. Other than multi-state trips, I hope to focus on a state at a time. For example, I have made 3 trips to New York at different times, so I may start there. But if the pictures are on a multi-state trip, I may include them there instead. New Hampshire has seen covered bridge trips, combination trips with courthouses, and trips that combined either Vermont or Maine. Day trips have been the case for Connecticut, Massachusetts, and Rhode Island. I've added a few for Maryland, New Jersey and Virginia. And sometimes, something might be on the way to another destination with my wife, and I have successfully convinced her to divert the trip a bit. I hope that you will enjoy the pictures and the stories. I can be found on Pinterest, where I have a number of boards devoted to downtowns, courthouses by state or region, covered bridges, historical buildings or monuments, and even lighthouses. In addition, I also have pictures on Flickr. So, until next time, happy travels--even if they are only in your imagination. It became apparent that completing a state by taking County Courthouse pictures might be a reality. South Carolina was my target. How to vary the approach into South Carolina from Georgia was the challenge. My March 2016 northbound trip would consist of filling a couple of holes in the map--Hampton & Williamsburg Counties. My Georgia segment was planned in order that I could enter South Carolina near Hampton and then, hopefully, get to Kingstree while it was still light. My decision was to go via Brunswick and Hinesville to get pictures of the old courthouses I had missed earlier as well as re-taking a couple such as Wayne County (when it was overcast during an earlier trip), and Long County for the same reason. That trip, however, started with an overnight near Volusia County in Florida. I also planned to visit Bunnell and St. Augustine before heading up to Glynn County, Georgia. The Florida map was filling in quite nicely in the center. What that would mean in the future was 300+ mile stretches of travel with no courthouse pictures. Of course, it also meant that I could count on a different route once in Georgia with little retracing of earlier itineraries. The old Volusia County Courthouse in downtown DeLand is a beauty, and the early morning hour meant no traffic or parking issues. Of course, the sunrise coming up behind the new courthouse meant that those pictures were not the best. Finding the old courthouse in Bunnell in Flagler County was relatively easy--it is now used as a private school--but the St. John's County Courthouse in St. Augustine has been built around completely. The best pictures, in fact, will come from the interior courtyard, meaning that you will need to go through security. From there, it was a straight shot up I-95 to Brunswick, Georgia, and arriving near the noon hour, I was rewarded with a stunning view of the old courthouse. A grassy lawn, numerous stately palm trees, and a gorgeous building, which I had seen the previous year. My traveling companion, Odie, our 14 year old Shi'i-t'zu, was happy that a shady spot to park was available. Onward to Hinesville in Liberty County, which required a detour through Wayne & Long Counties respectively, I was pleased that the weather was co-operating, and that it was too early in the season for the gnats. The old Liberty County Courthouse is a beautiful brick building with a white cupola (seen below), which I had driven by the previous year. There are two books which I found to be extremely useful, although the second one was not obtained until later in 2016. The first one is Georgia County Courthouses by Rhett Turner. Its pictures are in alphabetical order by county. The second one is Courthouses of Georgia by George Justice (text) and Greg Newington (pictures). Both were infinitely valuable in my quest, although the second one is organized alphabetically by region. As I motored on to Hampton, South Carolina, I was happy that I did not forego the opportunity to get pictures of the ones I had missed. The courthouse in Hampton was a nice looking one, but the 122 mile trek to Kingstree was a race against darkness. I won the race and the beautiful, white Williamsburg County Courthouse, with its flowing stairwells adorning the face of the building, was a sight to behold. My next segment, would however, involve one of those two for one choices as North Carolina beckoned. My goal had been to get pictures of the courthouses in Bolivia (new) and Southport (old) in Brunswick County before settling down for the night in Wilmington. But it was dark, and it meant severe backtracking in the morning, so I left another island. In the morning, I would get nice first light pictures of the New Hanover County Courthouse in downtown Wilmington, before getting photos in Pender County (Burgaw), Duplin County (Kenansville), and Sampson County (Clinton). I would then arrive at my sister's home around noon. My southbound adventure will follow. For more courthouse pictures in Florida, Georgia, North Carolina, and South Carolina, click on the hyperlinks. Last week, I went to a corporate sales rally for PrimeLending. I had never been to Texas before and in glancing at the agenda, I noted that a speaker by the name of Andy Andrews was going to talk the first morning. We were all given a copy of a book called The Noticer. "Great," I thought to myself. "I now have something to read on the trip back." Little did I know how much I would enjoy reading that book. Andy Andrews is about my age and he started to give a little background about himself. He had lost both of his parents within a few months of each other as a young man. He left college. And he essentially entered the world of the homeless. He has a chance meeting, as if there is such a thing, with an older gentleman who simply is called "Jones". Jones proclaims himself to simply be a noticer, although, he also seems to be an encourager. Jones points out things to young Andy that he does not notice about himself. And we see Andy grow from living under a pier to where he is today. There are others besides Andy who are touched by Jones. And the underlying message is that what we do matters. And it makes a huge difference in the world whether we realize it or not. One thing Jones did for Andy was to get him to read books. Biographies rather than novels. And Andy could see the huge difference those written about made in this world. The biggest thing they all had in common was that they took action. And they made decisions and did not change them after making them. This book is not a long one. But it can have a long lasting effect on you. It is well worth reading. And taking action on. A friend of mine, Jeff Gwynne, picked up the hobby of golf about the same time I did. We have both discovered that golf is not a hobby. If you have never played golf then you will not understand that about the game. If you have, then you know exactly what I am talking about. We have golfed together a couple of times at his 'office' course in southern New Hampshire. We actually met for the first time there after striking up a friendship through participating in numerous ESPN fantasy games over the years. He went to Bowdoin. I went to UMaine. We play in the Maineiacs leagues of most all of the fantasy games possible. Even fishing and car racing which don't really take up much of our time in real life. After one recent exchange of emails on our golf experiences, Jeff sent me this book. Extraordinary Golf is the name of the book. I wasn't sure what it contained. What it contains is a different way of looking at things. And golf is one of them. The author, Fred Shoemaker, teaches golf and he had some pretty amazing stories about how people look at golf in a usual way. We make up excuses for poor performance before we start, setting ourselves up for poor expectations from others and from ourselves. Can you imagine speaking to a client saying, "I really have had trouble lately in trying to put together a good mortgage application, but I've been trying a couple of new things and I think this one may be better than recent ones."? Do you see how ridiculous that sounds? Shoemaker writes, "a golfer's experience consists of a triangle of performance, learning and enjoyment. If these elements are in balance, they all work well. But if they are out of balance, each one suffers." What a great description of our profession! If we are stagnant by not learning, our performance suffers and our enjoyment suffers. If we do not enjoy or profession, we will not learn new things and our performance will suffer. If our performance is sub-standard, customers will go elsewhere and we will not enjoy our profession and will not want to learn. He later writes, "You start out playing your usual round, but there comes a point--maybe as you're walking downe the fairway, maybe in the pre-shot routine--where if you are lucky, you can 'enter' the game of golf. That is the time, I believe, when golf truly exists for people. You become totally immersed in the game, time seems to disappear as creativity begins, and what emerges is extraordinary golf." Again, a great illustration of what can happen in our profession, not just on the golf course. We never know in golf how the game will turn out. I had a tough time on the first hole yesterday. I then remembered a passage in the book about the possibility of golfing your best after a poor hole if you didn't dwell on it. I parred the next hole with a putt from the fringe. And I went on the have the 2nd best score all year, but I played the best round ever as far as the triangle is concerned. It was extraordinary golf. When you think about it, there is not a lot of difference between 211 degrees and 212 degrees. But it is the difference between water almost boiling and water boiling. There are lots of applications at work here. Having an opportunity and making use of that opportunity. Having a lead and following up on that lead. Closing a deal and following up after the deal is closed. Thinking about a client retention program and using one. Thinking you should go out of the office to make sales calls and going out of the office to make sales calls. There is almost anything that could be done a little better and have a little more effort. 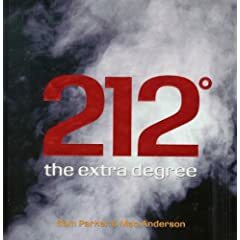 212 degrees: The Extra Degree is a book that may take you an hour to read. But even if you only come away with the concept of one extra degree to make water boil, you will have something to apply to every aspect of your life. Mac Anderson and Sam Parker have put lots of great examples in this book. One of the early quotes pretty much sums it up. "Why do you enter into any activity with anything but a COMMITMENT to achieve your objective of that activity--not a desire to achieve your objective, but a COMMITMENT? I would recommend that you get this book, read this book and apply its principles. Even with the tremendous amount of difficulty the mortgage industry has faced in the past 18 months, there are still people with a need that you can help them fulfill--IF you give them the extra degree. A little over a decade ago, Linda Ellis wrote a simple poem entitled "The Dash". If you go to any cemetery, you will see gravestone after gravestone with two dates separated by a dash. Some will have epitaphs. Others will state relationships. The poem's focus is on what has happened in between. Were people touched by that individual in a special way. Mike + The Mechanics recorded a song called "The Living Years" in the late 1980s which reflects some of the same sentiment. It is too late to say "Thank you," or "I love you," or many other things once the other person has died, or if YOU die before saying something. A book based on the poem has been published by Simple Truths and is well worth reading...and giving. People will not remember the day you were born, and may not remember the day you die. They will remember what you did when you were living the dash. Take some time today to thank someone or write them a note as to how that person has impacted your life. You may never know how much it could mean. The quote on the back of the book is from Joseph Epstein who once said,"We do not choose to be born. We do not choose our parents, or the country of our birth. We do not, most of us, choose to die; nor do we choose the time and conditions of our death. But within this realm of choicelessness, we do choose how we live." This is what The Dash is all about. What's in YOUR Dash? I just finished reading yet another book by Jeffrey Gitomer. This one, The Little Red Book of Sales Answers, has loads of good information in it. Just like all of his other books. One section has answer number 30. "What are the three dumbest questions in sales?" I am really conscious of these questions now. Gitomer actually ranks them. Dumb: "Have you ever heard of us?" Dumber: "Can you tell me a little bit about your company?" Dumbest: "What will it take to get your business?" The answers are pretty much what you'd expect and it goes against the old adage "There is no such thing as a dumb question." Maybe from a potential client, but WE can still ask dumb questions! Then there is answer number 58. "How can I prevent the prospect from going with the lowest price?" We have all lamented about rates being too high, haven't we? One thing to remember is to develop friendships because that is the great un-equalizer. Gitomer lists a number of ideas to take price right out of the equation. Question number 71 is an eye-opener--"How am I helping my customers build their business?" If you can help your client or potential client by sending referrals, won't that turn on the spigot in the other direction? If you can help their business become more successful, can't that show that you are different from others in your field? I often tell area Realtors about FSBO signs I have seen. They may have already seen them, but they know I thought enough to tell them. I tell appraisers about private sale closings so they can add to their comp base. They all appreciate knowing. Part Five is a great summary of the book. Building the Friendship. Building the Relationship. Earning the Referral. Earning the Testimonial. Earning the Re-order. Each of the five is important. The sum of the five together is greater than the sum of the five parts. 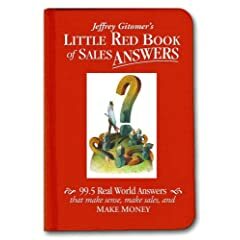 You owe yourself the purchase of The Little Red Book of Sales Answers. A few months ago, I wrote about a book being on back order. That book was Jeffrey Gitomer's Little Green Book of Getting Your Way. I am sure that you are thinking of a little kid pitching a fit or throwing a tantrum in a department store in order to convince the parent to give in and allow the kid to get his way. That is used as an example, but it is not really a focal point. It is far better to convince the other party that it is a good idea to do business with you and essentially have that person believe it is his decision. A whole section of the book is devoted to presentations ala Power Point. What you should do and what you should not do in a presentation. And why you should practice your presentations ahead of time. Becoming known as an expert is a big part of becoming successful because if people are seeking you out as an expert then you have a much easier job in letting them choose what to buy. Another section of the book is devoted to hot air. Once the sale is made, stop talking and start writing the order or taking the application or the lising agreement. Don't 'un-sell' by being a windbag. As with other Gitomer books, this one bears re-reading, highlighting and studying. There is a lot to learn and re-learn. I plan to use it in the development of Power Point presentations. And I will find it a lot easier when it comes to getting my way. I have previously mentioned that I recently took up golf. I enjoy it and wonder why I waited until I was late into my 40s before I picked up the game. I have often heard about business done on the golf course, but never figured I could put in the time. As a member of the Newport Country Club, I see a lot of people who I did not realize played golf. Including a fellow for whom I closed a loan last month. He was referred to me by another member of the Country Club. Now whether the connection is because I am the only mortgage banker who is a member there or because I do business with the referring member, I do not know. But, business is not always overtly done there. David Rynecki, who grew up near Walpole, New Hampshire, has at least that in common with our new golf pro at Newport. 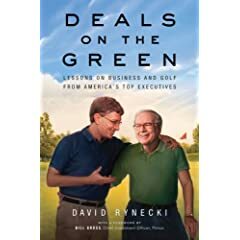 And as the author of this 18 chapter book, he reveals many ways that golf reates to business. No coincidence in the number of chapters corresponding to the number of holes on the course. The author has played with many famous and not-so-famous CEOs, and has learned important lessons from all. The way people play golf is the way they approach business. And a lot can be learned here. Some of the lessons include not taking yourself too seriously and looking for opportunities that others cannot see. Some executives insist on new hires taking up the game. Seeing if people have a bad temper, take wild chances, cheat and exercise proper etiquette can reveal a lot about a person's character. And sometimes that can lead to NOT doing business with someone, NOT recommending someone and NOT hiring someone. It also is not a place to be a phony. If you are overtly trying to get business done because you paid for someone's greens fee, it could backfire. Golf is a simple game. A subtle game. And that is the way it is in business sometimes. Sometimes deals off the green happen and they are not really deals on the green. Even if you are not a golfer, I think there is plenty to gain by reading this book. And perhaps even more to be gained by becoming a golfer.